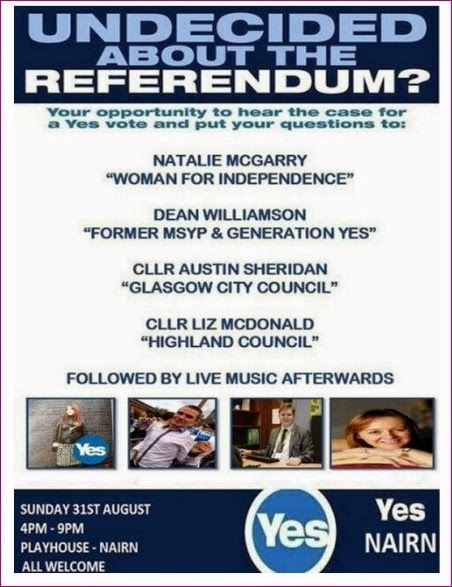 YES Nairnshire activists have booked the Playhouse for Sunday the 31st of August - see poster below. There will be a series of speakers and then live music. Are you planning anything in the final run-in to the Independence Referendum on September the 18th? Be you of YES, NO or DON'T HAVE A SCOOBIE YET factions - tell us and we'll put it on the Gurn. Also send us your thoughts on the Referendum. We've already had Stephen Fuller tell the Gurn which way he is voting and why - tell us and we will publish your thoughts too. We'd be delighted to see you step onto the Gurn digital soapbox.